Fiji Needs Us! ANZ Sail Fiji is on! Home/All News, ANZ Sail FIji, Blue Water/Fiji Needs Us! ANZ Sail Fiji is on! The Royal Akarana Yacht Club race from Auckland to Denarau, known as ANZ Sail Fiji, is definitely going ahead as the race will bring tourism to the area which will assist greatly in their recovery process, after parts of the island nation were devastated by Cyclone Winston. The Category 5 storm which wreaked havoc across the Fiji Islands on the 19th February, devastated parts of the region, however the area where the race finishes, is recovering quickly. Ex-pat Nigel Skeggs took shelter in his Denarau office with his family as the eye of the storm passed to the North. Sadly, 43 people lost their lives and 55,000 are homeless. Cyclone Winston was the second largest cyclone to ever come ashore on a populated area. It recorded average wind speeds of 250km/hour with prolonged gusts of 300km/hour or 160knots. It’s force was stronger than Hurricane Katrina. “We got hit hard but the marina where the ANZ Sail Fiji fleet will berth, is fine. In fact if you came to visit the main tourist areas today you would not guess that a system of this size came through only a week ago. Fijians are very resilient by nature and the country has emerged on the other side of this event stronger than ever. We are a united Fiji committed to building a better future for all.” said Skeggs. “We really need this race to go ahead. It is important for the rebuild process. Staff who work at the resorts have lost their homes, and they need the sailors and tourists to visit Fiji so they can work to rebuild their lives. 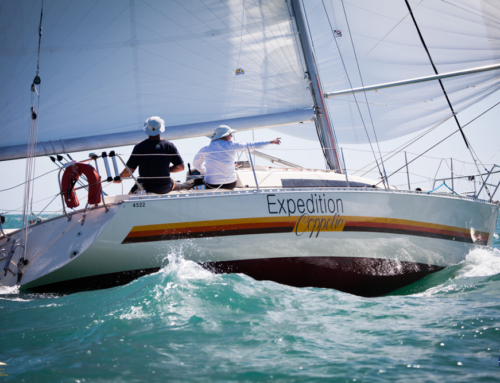 “If you are considering doing a race to Fiji, we ask that you please enter ANZ Sail Fiji. We need visitors now more than ever,” continued Skeggs. As Fiji begins the rebuild process, Royal Akarana Yacht Club has offered support and will be assisting with aid. The Denarau Yacht Club and RAYC have a long standing relationship, and that will continue when the 2016 ANZ Sail Fiji race starts on the 4th June at 1100 hours. RAYC Vice Commmodore Sally Garrett said that racing to Fiji was important to show faith in the island nation and bring tourism back to the area. “Fiji relies on tourism as a major capital driver. RAYC will bring over 300 sailors, supporters and holiday makers to the region as a sign of support,” said Garrett. This will be the 22nd race to Fiji for RAYC. As the home of blue water sailing in New Zealand, RAYC will continue it’s commitment to hosting Category 1 races. Seven monohulls and one multihull have already entered the race, including Christiaan Arns (Notorious) who was the second to last boat to finish in the 2014 edition of the race. “It doesn’t matter how long it takes to finish, this is definitely a must do race. We will be back on the start line with an excited crew, ready for the next adventures. Bring it on!” said Arns. Fiji Airways are currently running specials to travel to and from the region. The resorts are open and are ready for bookings. I have booked a trip to NZ and then to Fiji with my wife. We heard about the cyclone Winston (a hurricane in the upside down world) and reached the same decision you have mentioned here about supporting the Fijian economy. We will be unable to meet all of you at the end of the race, but I hope everyone is safe and enjoys all the islands have to offer. If you were in the 1973 race, please reach out to me by email at: Jeffrey@garchow.com. I would love to reminisce about the “73 race.